First up are New York Alcoholic Anxiety Attack, who despite the name, are from Bradford. This young three piece band have their microphone stands decorated with fairy lights and flowery garlands and there are two half mannequins (waist up) to decorate the stage. Their visual image seems mixed with the bassist wearing a furry horned hat resembling an American indian bonnet, while the guitarist seems to be going for more of a glam/sleeze rock image. Their music is rock and they manage to impress a reasonable percentage of the crowd. The bands stage performance would have been enhanced by moving around a bit more - the occasional step forward or back doesnt really do much and leaves the performance looking very static. Next up are London based rockers Voodoo Six. Despite being from London this five piece are very reminiscent of American band, Black Stone Cherry, and I'd strongly recommend fans of that band to check out Voodoo six. This was my first time listening to voodoo six and I came away very impressed. 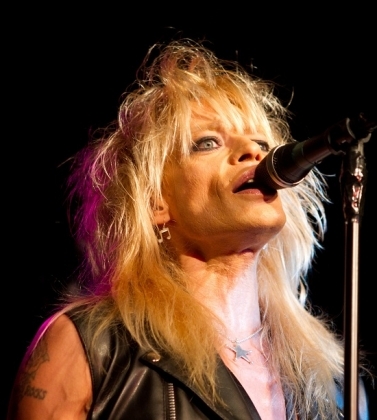 Tonights headliner is the former Hanoi Rocks frontman, Michael Monroe. This man is a true showman and delights in entertaining the crowd. His performance tonight is as energetic as always - he races around the stage, jumps into the photo pit and climbs on the barrier to get close to the fans and puts on a fantastic show. Security got a bit nervous when he stood balancing on the top of the barrier and pulled him back down the first time he tried it, but later in the show allowed him to do it again without interference. As always, he not only sings but also plays his saxophone for some songs and harmonica for others. Michael Monroe had cancelled interviews before the show and cut sound check short to save his voice, and it clearly paid off as he sounded on top form. Ginger and Sami both play superbly tonight, a feat made even more impressive by the fact that they'd both spent several hours drinking in the pub next door before the gig. The setlist includes plenty of songs from his new solo album (Sensory Overdrive) as well as some Hanoi Rocks classics. As the show comes towards the end, Michael Monroe swings round while playing the Saxophone...and the Sax collided with Steve Conte's face, resulting in a flow of blood. Luckily its soon taken care of and they're back on stage for a song that isnt on the setlist and which has only been played at some of the UK shows and not others. The fans quickly realise that something special is happening when Michael Monroe heads to the back of the stage and takes his place at the drums, while Ginger moves to center stage to do the vocals as well as guitar. The band launch into an excellent version of the classic Ramones song, Blitzkrieg Bop, with Michael Monroe playing drums like a professional - a great way to end a fantastic show. are band is barring me happy always give me ispiration? ?\m/.